A live concert recording featuring master Irish traditional musicians. 100% of proceeds benefit the Center for Irish Music in St. Paul, Minnesota. 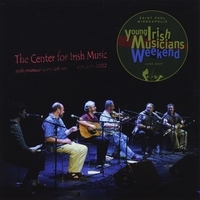 June 18, 2008 St. Paul, Minnesota – The Center for Irish Music proudly announces the release of the long-awaited 1st Annual Young Irish Musicians Weekend Live! CD, featuring master artists James Kelly (fiddle), Tommy Martin (uilleann pipes), Paddy O’Brien (accordion), Daithi Sproule (guitar and song) and Fintan Vallely (flute). This is a rare, live recording featuring some of the world’s best known Irish traditional music masters. Proceeds from the sale of this CD go to supporting programming at the Center for Irish Music, a non-profit, 501c3 community music school in St. Paul, Minnesota, USA. This live recording was made on June 23, 2007. It was an amazing weekend of sharing and learning - and an amazing night of music and storytelling. We hope you enjoy this recording in the spirit it was made – as an educational, inspirational piece of art. The Young Irish Musicians Weekend strives to be the premier North American educational and social weekend exclusively for musicians under the age of 21. This weekend is an opportunity for our next generation to be the main focus, to learn from master’s of the art of traditional Irish music without the stress of competition or performance. The Weekend features instrument, style & repertoire workshops, sessions, concerts, socializing and more. Open to students of all instruments & levels under age 21. We are inspiring the next generation of upcoming Irish artists to be the best musicians they can be. The Young Irish Musicians Weekend is presented by The Center for Irish Music. The Center for Irish Music is a non-profit, 501c3 organization teaching traditional Irish music to students of all ages on a variety of instruments. It is the Center’s vision to support the traditional Irish music community in the Twin Cities into the future. Contact The Center for Irish Music via email at admin@centerforirishmusic.org or call 651-815-0083. James Kelly, a native of Ireland, is one of the greatest Irish traditional fiddlers alive today. James is currently the “TG4 Irish Traditional Musician of the Year”. He has 18 albums to his credit and recently released his latest recording, “Melodic Journeys.” He continues to tour with some of Irish music’s leading accompanists. From County Offaly Ireland, Paddy O’Brien is regarded as one of the tradition’s most important repositories. His mastery of the two-row button accordion was acknowledged through prestigious awards: he was named Oireachtas champion four times, and All-Ireland senior accordion champion in 1975. Paddy currently records and tours internationally with Chulrua. He also plays around the Upper Midwest with an ensemble, The Doon Ceili Band. Daithi Sproule, a native of Derry in the North of Ireland, is a singer and guitarist and one of the premier accompanists in the Irish tradition. He was one of the first guitarists to use and develop the DADGAD tuning, a style now widely used in Irish music. Daithi is also a lovely singer with a large repertoire of rare songs in both Irish and English. He\'s a member of the famous group \"Altan\", and has recorded and performed with many of the great Irish musicians of the last thirty years. Daithi now lives in Minnesota and performs regularly, both with Altan and in a duo with fiddler Randal Bays. Fintan Vallely is an Irish flute player and writer of music. Hailing from Co. Armagh, he began playing flute and uilleann pipes in his early teens. Specializing in flute, he played throughout Ireland and abroad. In the 1990s he toured with Tim Lyons performing satirical song. He has contributed to academic journals and conferences, and has produced and edited several books, most important among them the A-Z reference work Companion to Irish Traditional Music. He teaches flute annually at the Willie Clancy Summer School in Miltown Malbay, Co. Clare, and lectures at Dundalk Institute of Technology, Co. Louth. Tommy Martin is an Uilleann Pipes player. His accomplishments include two All Ireland titles on the pipes. He has performed both solo and in bands and has been seen performing with \"Riverdance\" in New York and the Chicago Virtuosi Symphony Orchestra. Tommy was teacher of the advanced pipes in Dublin until he moved to St Louis, Missouri in 2003. He has two solo CDs and can be heard on 12 other albums as a guest musician. When not on travel, he works for St. Louis Irish Arts teaching music on fiddle, flute, mandolin and Uilleann Pipes.